A painting by Marilyn Farinacci. September arrives and so does a new show at the Nicholson B. White Gallery, in St. Paul’s Episcopal Church. Four talented artists from Cleveland’s East Side—Marilyn Farinacci, Ben Hauser, Ruthe Stone and Catherine Davies Paetz—are featured in Contemplating Light and Color. The public is invited to attend the artists’ reception, which opens the show, on Friday, Sept. 7, 5–7 p.m.
Farinacci's vibrant paintings are stunning and complex. She creates visual concepts on canvas using layering, color and form in a unique way. Her contemporary paintings give the illusion of a three-dimensional space on a two-dimensional surface. Hauser refers to himself a photographic artist. The abstract imagery that makes up his body of work is based on his creative process, in which he combines photography products, color chemistry and exposure to light. His large- and small-scale pieces have a mystical feel. They are one-of-a-kind, darkroom prints. Working in a more traditional vein is Stone, an artist and printmaker. In this show, she exhibits a variety of contemporary prints including portraits, landscapes and still lifes. 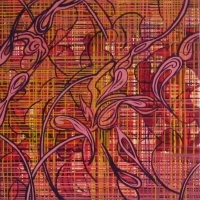 She uses various silkscreen processes, sometimes including photo emulsion and drawing techniques, to attain multi-layered images. Rounding out the show is the work of Paetz, a jewelry artist and metalsmith—and an active parishioner at St. Paul's! She demonstrates how colorful enamel, metal and light can be combined and made into beautiful finished pieces of jewelry. The show will be on view through Nov. 24. The gallery is free and open on weekdays, 9 a.m. to 5 p.m., and Saturdays and Sundays, 9 a.m. to 1 p.m.
Robin Outcault is co-director of the Nicholson B. White Gallery.